There's a lot of fun in watching a disorganized mess. It's why we enjoy utterly terrible movies more than the merely mediocre. Now that we're introduced to this new crop of digidestined, the brave, brave children fated to save the Digital World from destruction, it should be time to see what they're capable of. Instead we get to watch them as they stumble about, completely dysfunctional as they attempt to grasp the rules of this world without killing each other. It's wonderful. Just as beating a boss in a video game can open up a new world to explore, Agunimon's scan of Cerberumon's fractal code restores a chunk of the missing territory surrounding Flame Terminal. While there are problems with this idea later on, for now it's nice to have a tangible way for the kids to make an impact on fixing this world. Frontier is rare in that Bokomon introduces us to big bad Cherubimon right off the bat, but it's going to be a long, long time before our heroes reach him. Usually they hear about the Devimons, Merukimons and Yamakis of the world first. It's our first proper introduction to Bokomon and heterosexual life partner Neemon as well. A “proper” introduction usually implies that it's not the first time we see them, but it is the first time we get a good feel for their characters. Bokomon does little more than serve as bland exposition and Neemon does little more than make stupid comments and pretend to be funny. Hence, a proper feel for their characters. Obviously included to integrate some Digimon into the main cast, one of the critical flaws of the series is how uninteresting these two are. Pro Tip: if you're trying to throw in a couple monster characters to counter the lack of partners, don't pick the digi-equivalents of Basil Exposition and Ralph Wiggum. Their blandness isn't such a flaw here in particular, but I must get this out now in fear that I will forget they exist until Bokomon's “pregnancy” down the road. What's offensive about Neemon in particular is the notion that they need to dedicate a character strictly to comic relief when there's such a fun early antagonism between Takuya and Zoe. Much like the underrated antics between Davis and Yolei, the arguing between these two is hilarious and adds needed discordance to the group early on. After JP's flirting and Takuya's disparaging (and downright sexist) comments, it's clear that Zoe feels the need to fight back, teasing Takuya for feigning maturity and accusing him of bad touching after she drags him down a hole. They're both aggressive and confrontational with each other here, serving the dual purpose of establishing character notes and being funny as hell. In a moment of unprecedented heroism, JP and Tommy decide this whole thing is stupid and conspire to catch the next train home. 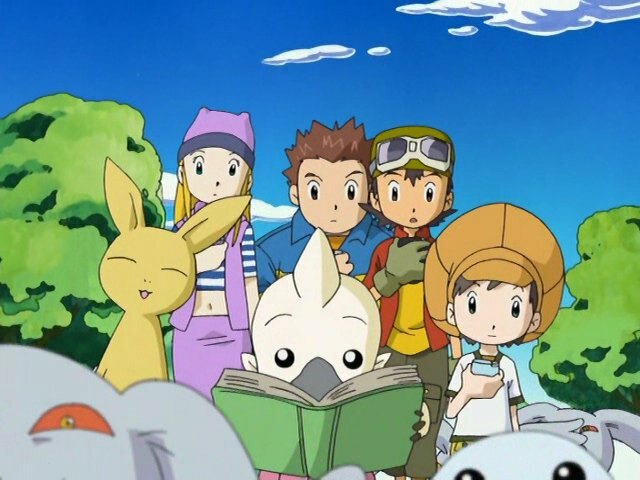 JP's efforts to bribe Trailmon Angler backfire when he gets an immediate sugar rush and speeds off, while his efforts to bribe a Pagumon for information backfires because Pagumon are nasty little bastards who chase after the two for the rest of the episode. Yes, they are perilously close to becoming not only the first digidestined to die, but the only ones fatally threatened by In-Training level Digimon. While all this is happening, Koji alights his train quietly, immediately begins hunting for his spirit, fights off the Pagumon with a giant pole, finds his spirit, one-hit KO's Raremon and mutters “don't touch me” and something about a life debt to Takuya. One of these kids is not like the others. Bokomon refers to Takuya as the “human who has restored what is lost.” That can't possibly be the subject of a prophecy in that book. It's too wordy! 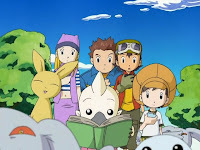 There are also unanswered questions about how the Digimon are aware what humans are and only mildly surprised that they're in the Digital World. Bokomon's book is written in that same Playstation code language as the train door last episode. It's still not digicode, but it probably should be. A Pagumon delighted with the restored land comments that they have more room to play Poyomon pinball. Poyomon pinball is now my second favorite game behind Upamon volleyball. Although it doesn't appear to produce results, JP gets one smart moment where he checks the direction of the draft underground to locate the nearest exit. That's +1 for him; I'm sure he'll get back up to zero in no time. 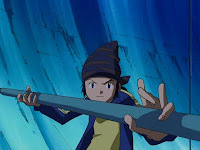 I think seeing Koji fighting off those Pagumon was one of the most badass things I've seen a digidestined do (Until Marcus came along) and it might have been the moment I started to like his character. TK fighting Digimon Emperor, for God's sake!! Imagine if Koji was a girl, as apparently was originally intended. -Being 3 months older than your man won't save you from falling into a pit.